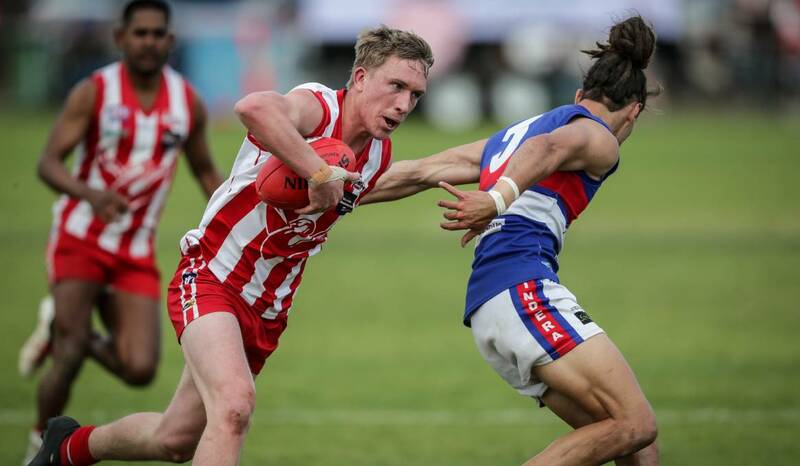 JINDERA full-forward Trent Castles put a trying week behind him to steer the Bulldogs to a 17-point victory over Henty in the preliminary final at Walbundrie on Saturday. Castles, who was cleared of a forceful contact charge on Thursday night after being booked by the match review panel, was outstanding with five goals in difficult conditions. 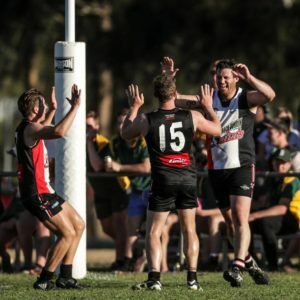 He was best afield in the first-half with four majors and kicked the sealer in the final quarter to book the gutsy Bulldogs a spot in next weekend’s grand final against Brocklesby-Burrumbuttock. “It’s been hell this week,” Castles said. “There were a few sleepless nights with the tribunal. “I’m glad I got here. “I surprised myself in the first-half because I’m normally quiet early but the boys were fantastic getting it down there. While Castles was the best forward on the ground opposed to Beau Connell and Josh Spencer, it was Jindera’s run and never-say-die attitude which proved the difference. Harry Weaven read the ball well in defence dropping in front of Swampie star Damian Cupido, Ryan Speed tagged Daniel Cox out of the game and Sam Myors was a strong performer on a wing despite being watched closely by Josh Singe. Jesse Wellington also got under Henty’s guard with three goals in a low-scoring match. It was Jindera’s third hard-fought win of the finals series after defeating Osborne by eight points and Holbrook by 22. “We just thought we matched up reasonably well on them today,” coach Kerry Bahr said. “We had ‘Speedy’ (Ryan Speed) on those quicker blokes. ”We have had three weeks of lighter training and we have some pretty good running players in the side. “I’ve always said we play well at Walbundrie. 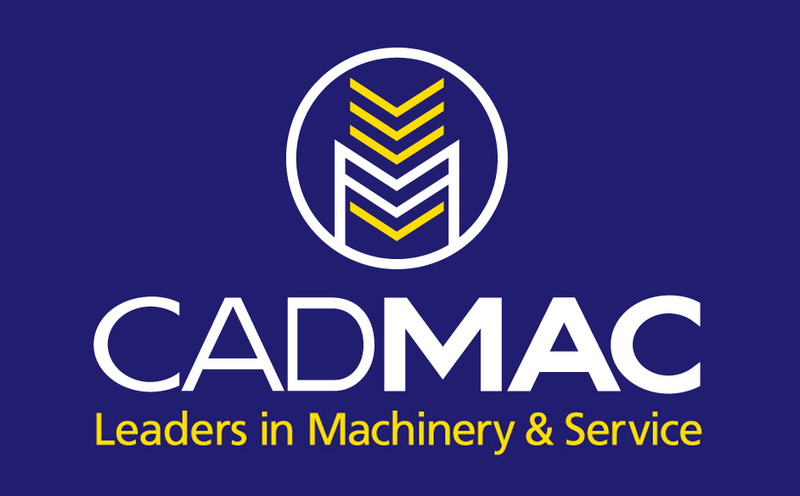 Jindera’s only injury concern was Sam Crawshaw who left the ground in the final quarter with a shoulder problem. He returned late with strapping. Henty rued wasted scoring opportunities, particularly in the third quarter, and paid dearly for three 50-metre penalties. Heath Ohlin and Harry Nunn worked hard in the midfield, Josh Gaynor was strong in defence and Chris Willis took the points in the ruck. Cupido threatened at times but was held to three goals by the evergreen Tom Weldon. It was another disappointing finals campaign for Henty after it bowed out in the first week of last year’s finals series. Brocklesby-Burrum trained on Saturday morning and will regain Azzi medallist Luke Schilg for the grand final. 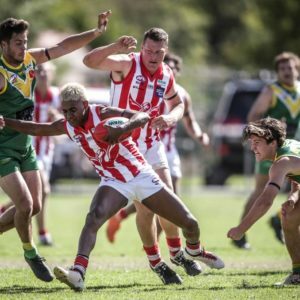 In other preliminary final matches, Rand-Walbundrie-Walla defeated the Saints in the reserves, Osborne were too good for the Bulldogs in the under-17s and Giants accounted for Osborne in the under-14s.